We arranged this port excursion outside of Carnival Conquest – Caribbean Cruise. 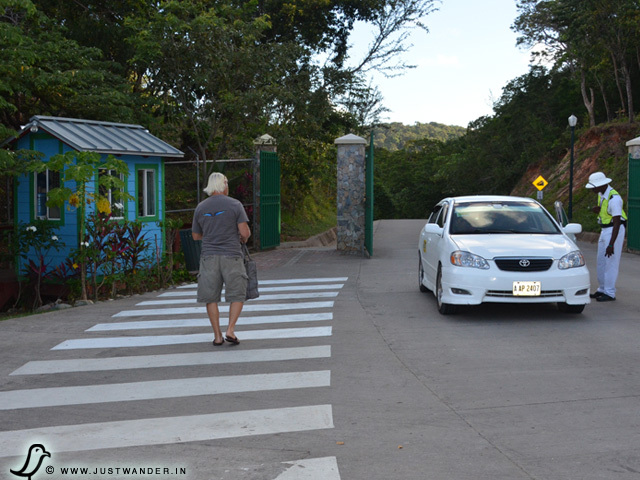 It was very affordable to enjoy the day in Roatan from the scenic drive West and East through villages to visiting the wildlife sanctuaries and getting up close and personal… in this case… a Sloth. 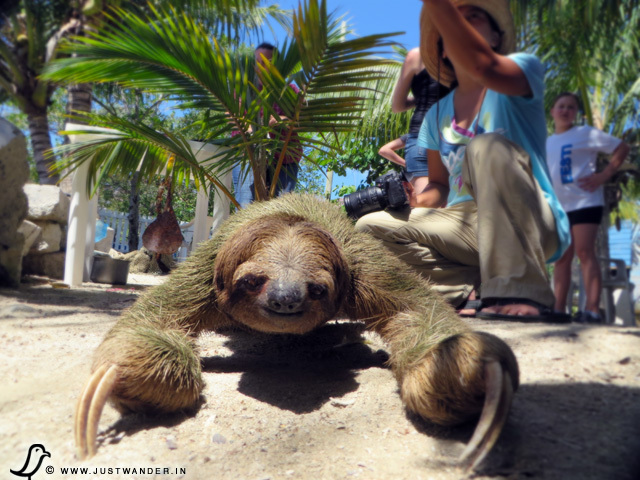 We didn’t know what to expect from visits to these wildlife sanctuaries and so we were very delighted to see and hold a Sloth… although, I don’t know if it’s a guaranteed experience by the tour vendor. 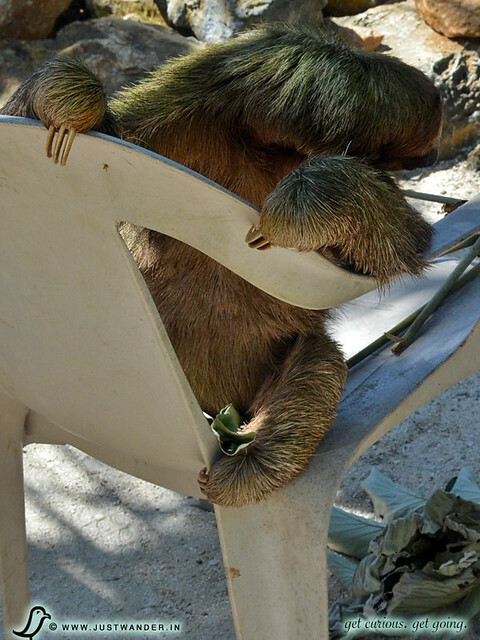 This particular sloth was more social and had a good temperament for visitors. We were told usually they’re up in the trees so it was a great treat! Then you’ll see a group of agents holding up signs for various Carnival Cruise excursions. 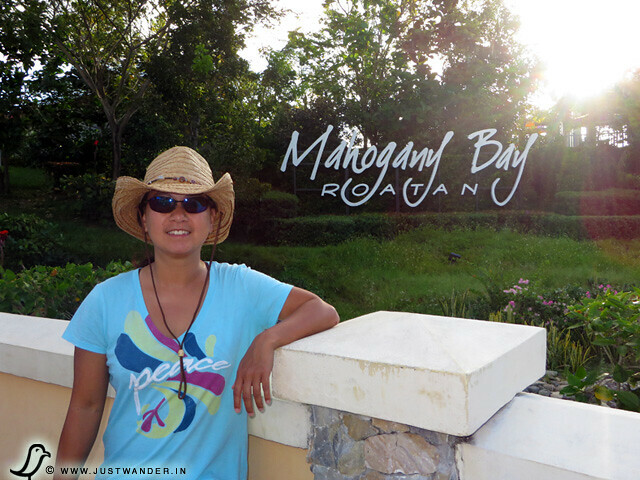 But if you didn’t arrange an excursion through the ship or want to see what other adventures you can take in for the day, you have to exit the Mahogany Bay Cruise Center. You see, Carnival owns this whole area so you won’t see competitors promoting their tours here. Veer left and at the end of the strip of shops and restaurants, you’ll take a slight right towards taxi and vans. Take another left for a short uphill climb to the gate. You can ask around and people will point you in the right direction. But you will see this gate and know you’re on the right track. After this gate, you head downhill where all third-party vendors for tours are waiting. The animal is so lethargic that its fur is often host to small moths, beetles and even algae. 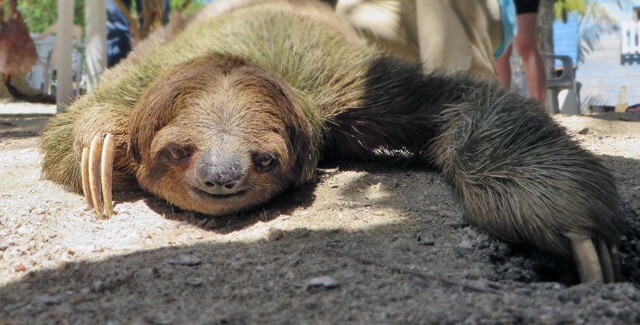 The algae coats the sloth’s brown, white or black fur with a greenish tinge camouflaging it against predators in the forest. 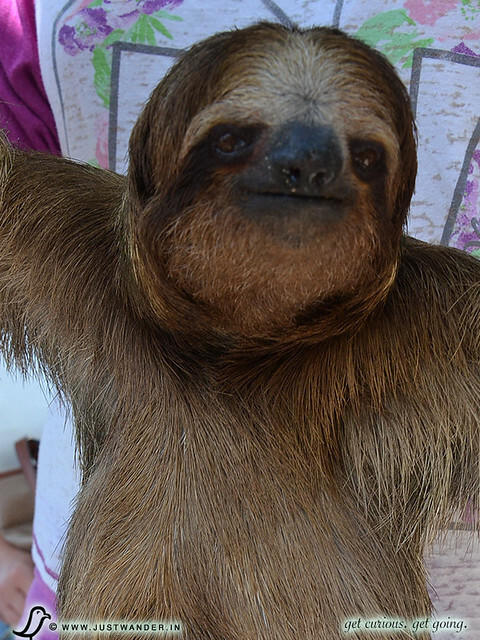 Sloths spend most of their time sleeping and eating in the tropical rainforests of South and Central America. Their main source of nutrition is leaves, twigs and fruit. The creatures spend as much as 20 hours a day sleeping while hanging from a tree limb or curled up near a branch. We’re told they’re not all as friendly as this guy (which I personally nickname “Chewie”… is it just me or does he remind you of Chewbacca yes, a Star Wars movie reference?! )… who lives amongst his other sloth buddies in the nearby trees. 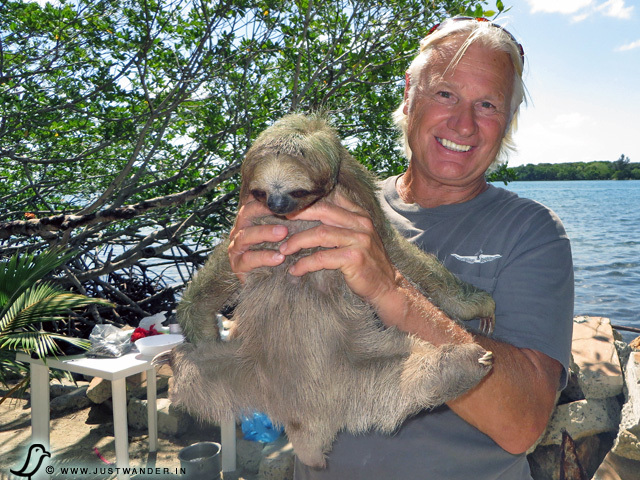 QUESTION: Where else in the world can you hold a sloth? Hi there, these are great photos. 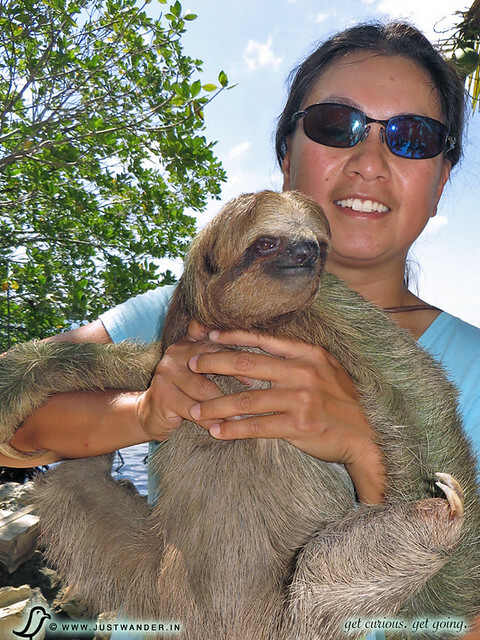 My girlfriend really want to hold a sloth. Do you you know the name of the wildlife area where you did this? We can’t see it in the tours from the cruise company and were wondering if you can do it from the ship? Sometimes travel research can feel like a 2nd job so, if you need help Bill is an Avoya Travel Independent Affiliate now and I’m sure would be very helpful in planning your fun. You can ring him at (toll-free) 1-844-876-0385. 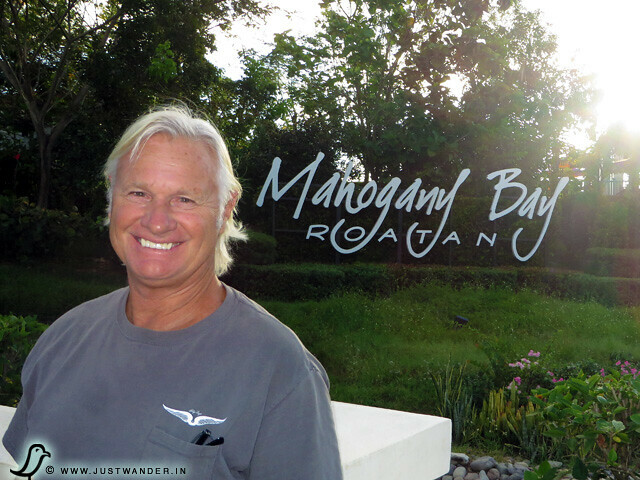 He can translate first-hand travel experiences to the Caribbean to help you on your trip. The name of the place is “Daniel Johnson’s Monkey and Sloth Hangout”. As previously mentioned, it was one of the stops on the “wild on wildlife tour” through Island Marketing. Wonderful experience. Going back in March with our daughters and that will be a must. Thank you Lance for sharing!